The following names will appear on the ballot for Moderator of the 2019 General Assembly. Ballots will be sent to presbyteries this month for members of presbytery to vote. The Committee to Advise the Moderator will count the ballots on April 1, 2019. The 2019 General Assembly will convene Sunday evening, June 2, 2019 in Waterloo, Ontario. The Rev. Amanda Currie, B.A.Sc., M.Div. Amanda Currie grew up in Ottawa at St. Giles Church. Gracefield Camp, PYPS, and participation in the congregation and choir all contributed to her faith formation and call to ministry. She graduated from Knox College in 2003 and served St. Andrew’s in Saskatoon from 2003–2017. In August 2017, she was called to First Church in Regina. Amanda is a pastor with a passion for preaching, teaching and pastoral care. She loves to sing and to share in ministries of music that include diverse styles that help us to sing our prayers and proclaim the good news with joy. Amanda is committed to both denominational service and ecumenical dialogue and cooperation. She has served as clerk of the Presbytery of Northern Saskatchewan, Presbyterian representative for the Truth and Reconciliation Commission’s National Event in Saskatoon, small group leader at Canada Youth, adult advisor for Saskatchewan Presbyterian Youth, chaplain at Camp Christopher, member of the Assembly Council, and convenor of the Ecumenical and Interfaith Relations Committee. Ecumenically, she has served on the boards of Interchurch Health Ministries Saskatchewan and the Prairie Centre for Ecumenism. She has also been a chaplain and instructor in the Prairie Centre for Ecumenism’s Program in Ecumenical Studies and Formation, and she was on the writing team for the 2014 Week of Prayer for Christian Unity international resources. Amanda is currently the Moderator of the Synod of Saskatchewan and Convenor of the Camp Christopher Committee. She also serves as a Presbyterian representative to the Governing Board of the Canadian Council of Churches. Living in Saskatchewan for the last 15 years, Amanda is well aware of the legacy of the Residential School System and the need for Presbyterians to be engaged with our neighbours in the work of reconciliation and responding to the TRC Calls to Action. 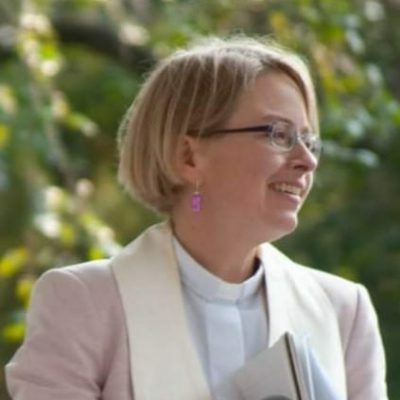 Amanda is married to Nicholas Jesson, a Roman Catholic theologian who is currently serving as the Ecumenical Office for the Archdiocese of Regina. Her personal experience of being in an interchurch marriage contributes to her desire for the unity of the church and her conviction that unity with diversity is possible through the love of God in Christ. Amanda is working on a Doctor of Ministry degree through the Toronto School of Theology on the topic of interchurch families. What are your earliest memories of church? The earliest years of my life were spent at Bethany Baptist Church in the West End of Ottawa. I don’t really have any memories of the church, but I know that my parents brought me for infant dedication in that community and that I attended Sunday School with my siblings. When our family moved neighbourhoods, my parents chose a new congregation close to our home–St. Giles Presbyterian Church. My earliest memories include going up for the Children’s Story in the front row and trudging across the street in our winter coats and boots to the Christian Education building for Sunday School classes. During the summer, we always had a week of VBS at the church, and I remember sitting in a circle on the basement floor singing Kum ba yah (It sounds like a stereotype, but it is a good memory for me!) and I remember the excitement of “Bring your pet to VBS day” which was great fun and very chaotic! I also remember a lot of Scottish accents among the older people of the congregation when I was young, which is quite different from the more diverse congregations we have today. I was one of a relatively small number of children and youth in that congregation, and I remember a sense of belonging and being treasured by the community. I have often said that it felt like I had a bunch of extra grandparents watching out for me and caring for me like their own. What pieces of scripture do you return to over and over and find especially formative? Luke’s Gospel is probably my favourite account of the life of Jesus and the beginning of the community of disciples who became followers of his Way. I love the abundance of stories and parables. I love the sense of the journey the disciples are discovering, how the community is expanding, and the good news is going out beyond one boundary after another. I love the meals and the conversations shared along the way, the odd collection of mis-fits beings gathered, and the occasional rule-breaking that takes place because other things are more important. One passage that I return to over and over is the story of the disciples on the road to Emmaus in Luke 24:13-35. In story form, this passage captures so many important elements of our lives of faith which include ups and downs, times of weariness, doubt and disappointment, as well as revelation, inspiration, and joyful response to God’s presence and call. I appreciate that the disciples walk together, sharing their hopes and their frustrations, that they reflect on their experience and on the scriptures together, and that Christ is present and guiding them even before they know it. But it’s not all about study either, because it’s in the midst of giving and receiving hospitality, sharing food and rest, that they can finally see that Jesus is with them. And in the hope, and joy, and guidance of Christ’s presence they go out with renewed strength to share the good news that will transform their lives and the whole world. This is a good model for our churches and ministries to embody. What books do you wish everyone in the PCC were reading? In this time in history in Canada, and given the role of The Presbyterian Church in Canada in running Indian Residential Schools, I wish that everyone in the PCC would spend some time reading for reconciliation. I must give credit to the Saskatoon Public Library for suggesting that reading could be a powerful way for non-Indigenous Canadians to learn and grow and work towards healing and reconciliation with Indigenous people on this land. They started the hashtag #Read4Reconciliation a few years ago and suggested an excellent reading list. Of course, reading cannot replace engagement with Indigenous people in our communities, supporting the PCC’s Indigenous ministries, and building relationships of respectful listening, care, and partnership for a better future, but reading can be a really good starting point and an excellent way to respond to Call to Action #59 of Canada’s Truth and Reconciliation Commission. I hardly know where to begin in answering that question because church music and hymnody is such an important part of my ministry and spiritual life. My congregations past and present will tell you that I do occasionally sing in my sermons, and I have been known to preach on the text of an excellent hymn or even the choir’s anthem. I appreciate diversity in styles, forms, and instrumentation in the music we use in our worship, but stress the importance of the congregation’s engagement in singing as an act of worship. I agree with John Bell’s suggestion that the eleventh commandment could be “Sing a new song unto the Lord” so I make good use of the 1997 Book of Praise, while supplementing it with resources from other hymnals, Taizé and Iona Community songs, Global Music, as well as good Praise and Worship songs. Other favourites are: “How can I keep from singing?” by Robert Lowry, “Table of plenty” by Dan Schutte, “Let justice flow down” by Doug Romanow, “Let us build a house (All are welcome)” by Marty Haugen, and “My soul cries out (Canticle of the Turning)” by Rory Cooney. What are you reading for pleasure these days? What is your image of the church at its best? I think that Acts 2:42-47 and Acts 4:32-35 provide us with good descriptions of the church at its best. When I read about the church being “of one heart and soul,” sharing everything in common with no one being in need, being devoted to worship and fellowship with signs and wonders being done, and testifying with great power to the resurrection of Jesus, and their numbers growing day-by-day, I sometimes wonder if these are idealized descriptions. I wonder if the author is wearing rose-coloured glasses as he looks back and describes the unity in faith and commitment to caring and justice of the first Christian community. Still, these are helpful images of the church to inspire our ministries and direct our missions. Notice that the people come together frequently – not occasionally because church is one of the things they like to do, but as often as possible because church is who they are as followers of the Way. The unity they share is not about theological agreement on doctrinal points, but a unity of spirit manifest in being together, giving generously, and meeting the needs of each and every one. Worship and fellowship are the central activities of the community, and they lead to signs and wonders – the ability to see God at work in their lives and in the world – and inspire the people to share their faith and welcome others into the Beloved Community. The church then and now is called to be a strong circle of worship, fellowship, and care, with a permeable boundary that welcomes others in, expanding and diversifying the community day-by-day. Who are some of the people who influenced you significantly in faith? Why and how did one of these people reform your understanding of life and faith? Many people have influenced my faith over the years, taught me through their witness, and guided me in responding to God’s call in my life. My parents, elders in my home church, counsellors at Gracefield Camp, as well as colleagues in ministry. Over the past 15 years of ordained ministry, the members and adherents of my congregations have helped me to grow in faith as well. But if I need to choose one person to say a little more about, I have to pick my husband, Nicholas Jesson. Nick and I met at the Toronto School of Theology when I was a Presbyterian studying for ministry at Knox College and he was a Roman Catholic working on a PhD in ecumenical theology at St. Michael’s College. We married a year later in 2001 and became an inter-church couple, meaning that neither of us switched churches but we have maintained our church affiliations and share together in the worship, service, and fellowship of both our churches. Our relationship has been a blessing to me in countless ways, and one of those blessings is that I have come to know and love another branch of the Christian Church. Of course, there are painful times when we personally experience the brokenness of the church manifest in divisions at the Lord’s Table and a lack of recognition of ministries. This has led me to a deeper longing for the unity of the church and a commitment to ecumenical dialogue and cooperation that I would not have had if I had not met Nick. Nick has an ecumenical impulse that leads him always to be asking what we can do together as churches. It is rooted in the firm conviction that we are already One in Christ and called to live into that unity through dialogue, study, common prayer, witness, and mission. He has a patience with theological differences that astounds me and that allows him to engage with and find common ground with a great diversity of Christians and churches. Across our differences, we are partners in life and partners in ministry as well, as he currently serves as the Ecumenical Officer for the Archdiocese of Regina and as an amazingly supportive and helpful minister’s spouse. What does faithful discipleship look like? The words of hymn #634 “Will you come and follow me” from the Iona Community describe the key elements of discipleship well. They include being called by name, going places and doing things that are new, and letting Jesus’ love grow in and through our lives. The hymn describes discipleship as “leaving yourself behind” in order to love freely and risk rejection, relying on God’s help through prayer. Specific actions called for sound much like the mission of Jesus as he describes it in Luke 4 – letting the blind see, setting prisoners free, healing the sick, and doing it all quietly without expecting recognition. There is a sense that in embarking on this journey of discipleship, you will become the person God made you to be, and if you walk on through the fear involved, your faith will equip you to reshape the world by becoming the hands and feet and heart and voice of Jesus in the world. Faithful discipleship is a commitment to serve and an openness to keep on learning and growing in faith. It is obedience to Christ, willingness to be corrected, and acceptance of the risk and sacrifice involved in following the path of Christ. It may be lived out in formal ministries and missions of the church, as well as in daily secular work, community service, relationships, and family life. What would you say is the core calling of the Church? What does it mean to be a Presbyterian in Canada today? I often remember a little brochure published by and about the PCC about 20 years ago. It described our denomination as “a thinking church with a tender heart” which I believe is still accurate, as well as a description that we could aspire to live out more fully. In keeping with our Reformed heritage, we value scripture study and a good sermon, and we expect to think deeply and be challenged in our worship and church life. But even when we disagree or debate issues vigorously in the courts of the church, we are called to love one another and to reach out in love beyond our community as well. Certainly, our church includes diversity of ethnicity, culture, language, age, gender, sexual orientation, and theological perspective. But we are bound together as a denomination through our love of the Reformed tradition and its principles, our participation in and obedience to the courts of the church, and our cooperation in ministry and mission through Presbyterians Sharing and Presbyterian World Service and Development. In addition, Presbyterians do not see our denomination as the only church that is “right” but we recognize our belonging within a beautifully diverse and unfortunately divided Holy Catholic Church. Before we are Presbyterians (who are ruled by elders and organized into congregations, presbyteries, optional synods, and general assemblies) we are Christians who are children of God, followers of Jesus, and filled with the Holy Spirit. We recognize many other Christian groups as churches, engage in dialogue with them towards understanding and agreement, and cooperate with them as much as possible in the mission of the church. What area of public life do you believe the PCC should be more involved in than it is? For a small denomination, I think the PCC does a pretty good job of studying, reflecting, and engaging in the issues of public life, particularly through the International Affairs Committee and the Justice Ministries work of the Life and Mission Agency. Through our ecumenical partnerships in the Canadian Council of Churches, Project Ploughshares, KAIROS, the Women’s Interchurch Council of Canada, the Evangelical Fellowship of Canada, and others, we participate in a lot of significant work, and Presbyterians provide more leadership and resources than our small size would suggest. I believe that Christian churches and other faith communities in Canada need to remain engaged in issues related to health care, end-of-life care, new and developing biotechnologies, and other issues where ethics, faith, and the meaning of life have significance. The PCC can continue to engage through our ecumenical partnerships, but we will also need to continue to explore these issues ourselves so that our representatives are able to articulate a Presbyterian position and so that we can give guidance on these issues to our church members. One of the goals of the Strategic Plan is to pursue spiritual renewal and faith formation as the basis for transformation within congregations. What does pursuing spiritual renewal look like for you personally and what could it look like for the denomination corporately? In my own life, spiritual renewal takes place when I am doing more listening than speaking, when I am quiet enough to hear God’s voice in prayer, study, and through the voices of people around me. And when I hear God’s voice, I am often led to give more – more of my time and effort to a new ministry project, more of my courage to a venture that scares me half to death, more of my attention to a person in need of care, more of my heart to loving someone who is difficult to love, more of my resources to God’s work in the world. Spiritual renewal leads me to more faithful discipleship. Growing up in the PCC, I have been blessed with many opportunities for faith formation and spiritual renewal. They have included Sunday School, VBS, youth groups, camps, PYPS, membership classes, Bible studies, conferences, and retreats, followed by theological education and countless opportunities for continuing education as a minister of the church. But there are many people in our pews for whom worship is their only participation in the church community. So, I think there are a few things we should seriously consider. First, how do we bring those opportunities for spiritual renewal and faith formation into the one major Sunday gathering? Can we be more creative in providing spaces for discussion, reflection, engaged prayer, and personal response in what we do when we gather? Second, we must not give up on intentional faith formation programs with our young people. Even if our congregations are small and we only have one teenager, we need to be creative. Partner with other churches in the Presbytery or with other Christian Churches in the neighbourhood. Support and use our church camps and synod and national youth events to plant as many seeds as possible. And finally remember, that faith formation is not just about programs, but it’s mostly about relationships. If we are intentional, mentoring relationships can lead to spiritual renewal and faithful disciples. What do you see as the role of the Moderator during the time we are discerning the mind of Christ regarding sexuality and the church? At the meeting of the General Assembly the Moderator needs to moderate. He or she must strive to do so in a spirit of hope for what God’s Spirit can do among us when we come together in prayer to do the work of the church. The Moderator should show respect for the commissioners, just as respect for the Moderator is required, and she should try to be patient, generous, firm, and prayerful. In the context of contentious debates relating to sexuality or other issues, the Moderator will bless the Assembly by being a non-anxious presence that demonstrates trust that God will guide us through the challenges. Although every Moderator will have their own convictions on divisive issues, these should be set aside in order to listen, encourage, inspire, and be a presence that reminds us that we belong to one another. In the year that follows, the Moderator has a unique opportunity to meet with and listen to the denomination through visits and engagements across the country. Excellent moderators in my memory have chosen a theme or a focus for their year of service to the church, and have dedicated themselves to speaking, writing, challenging, and encouraging the church in a particular direction. In this time in our history and discernment regarding sexuality, a theme related to unity and diversity would seem appropriate. Climate change has implications for all aspects of our lives from the energy sources that power our daily lives to relationships between countries in the Global North and Global South. What is your vision for The Presbyterian Church in Canada and for Presbyterians in Canada as we seek to honour God’s creation? I believe we are on the right track when we continue to grapple with the issues related to climate change, the issues of justice for those (primarily in the Global South) most impacted by climate change, and the continuing challenge and call to change our practices as individuals, families, churches, and most importantly as countries, to slow down the dangerous warming of the Earth. General Assemblies have made decisions to speak out on these issues in the past, and sometimes to change our own policies towards being less harmful for the environment. We need to do more, and to encourage our presbyteries and congregations towards better stewardship of the Earth’s resources as well. I am aware of the “Green Churches Network” that arose out of the ministry of the Canadian Centre for Ecumenism in Montreal. I wonder how many Presbyterian congregations have participated in the network which aims to equip faith communities for better ecological practices while educating members to live in a way that stewards creation. We should also be listening to young people. Many of them have grown up on a planet that was already “too far gone” from the ravages of human industry. And yet, so many of them are passionately committed to reversing the damage and healing the planet. Perhaps they can lead us in making the sacrificial changes that are required. There has been much talk about the unity and diversity of the Church. What is your understanding of diversity within the Church and your experience and understanding of ecumenism? I believe that the church is both enriched by its diversity and challenged by it. The Apostle Paul taught the conflicted Church at Corinth that there were varieties of gifts but the same Spirit, and that all the diverse members of the Body were necessary to make one functioning Body of Christ. He tried to convince them to see the dignity of the other parts, and when they struggled with that, he told them they just needed to love one another and that would be enough. Of course, there are some diversities that are easier to accept than others. We can mostly agree that diversities of language, generation, gender, ethnicity, and culture enrich our communities of faith, although we still struggle at times with racism, sexism, ageism, and prejudice even in the church. But when it comes to differing theological convictions, especially about topics that we feel are very important and that affect us personally, our diversity can turn into deep division and a host of negative feelings. I believe that we are called to unity, not only within the PCC but as One Church throughout the world. Ecumenical dialogue between denominations and dialogue within the PCC about our differences can help us to understand each other better, break down stereotypes and assumptions, and discover much common ground. But there will be topics on which we will have to agree to disagree, at least for now. So, the question is whether or not we can live together and keep on loving one another with our differences. Can we make space in the church for another perspective on human sexuality and find ways in our polity to allow for differences in practice? Like a married couple that disagrees on an important matter, we need to decide if we can stay together and accept our differences, or if they are so deep and divisive that we must separate. A separation could be devastating, but staying together and continuing to fight, likely isn’t the answer either. There is much more that I want to say about ecumenism, about the scandal of division, about the experience of living in an interchurch marriage, and the longing for the fullness of unity for which Jesus prayed in John 17, but this answer is already way too long. But let me just say that I have hope for the unity with diversity of the PCC because I have hope for the unity with diversity of the whole Christian Church. That unity won’t likely come about through a miraculous agreement about sexuality, but it will come about through our cooperation with the Holy Spirit in teaching us to love one another. The fact that many Presbyterians still want to give it a try gives me hope, but that is the subject of the next question. Where do you see signs of hope for the world and the Church? In the church, I see signs of hope when hundreds of young people gather to worship and learn together at Canada Youth, and when I witness a young person in my congregation making a profession of faith or stepping into a role of leadership or service. I see signs of hope when congregations that are struggling with their annual budgets take risks for mission and miraculously meet their targets for those life-changing ventures. I see signs of hope when church members decide that they can change things from the way they’ve always done them in order to make space for growing diversity in their midst. I see signs of hope when I read PCC mission moments or the annual report of PWS&D. I see signs of hope wherever the gospel is proclaimed and the sacraments celebrated, where people gather to worship in spirit and truth, where they place their trust in God, pray fervently for the church and the world, and open their hearts and lives to engage in God’s mission. Reflecting on 2018 as it came to an end, I heard a CBC reporter comment that it was a difficult year for the world. Then she quoted from Mr. Rogers, a beloved Presbyterian minister with a TV ministry to children. He said to “look for the helpers” and the reporter assured her audience that 2018 was just as full of helpers, Good Samaritans, and people of good will, as it was marred by hatred, violence, racism, and strife. They may not always make the headline news, but they are there, and Canadian Presbyterians are among them. That also gives me hope. Who are some of your most treasured and influential Christian thinkers and writers? The Rev. 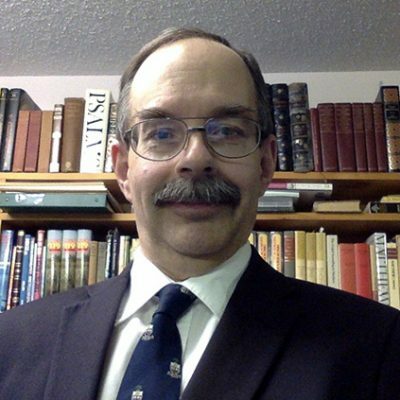 James T. Hurd, B.A., M.Div. James has served for 32 years as a pastor and presbyter in The Presbyterian Church in Canada. Born in Kirkland Lake, Ontario, he graduated from Knox College, Toronto in 1986 and was posted as an ordained missionary to northern Alberta, where he served five and a half years at Wanham and Blueberry Mountain, followed by a call to St. Paul’s Church, Woodstock, New Brunswick, where he ministered for ten years, before being called to Parkwood Church, Ottawa, which he has served since 2001. He has served as clerk of the Presbyteries of Peace River and Ottawa, as moderator of the Presbyteries of Peace River and St. John (now New Brunswick), as deputy clerk and acting clerk of the Synod of the Atlantic Provinces and as moderator of the Synod of Quebec and Eastern Ontario. He has moderated two special judicial commissions of the General Assembly. He served six years (1997–2003) on the Assembly Council, was a member of the special committee to revise chapter 9 of the Book of Forms, and for six years (2011–2017) as a member of the Committee on Church Doctrine. Since 1999, he has collaborated in the publication of the online PresbyCan Daily devotionals as Devotional Editor. Ecumenically, he served as secretary of the Central Peace Ministerial Association and at different times both as secretary and president of the Woodstock and District Ministerial Association. From 2004–2010 he chaired the board of directors of the Algonquin College Campus Ministry. He is presently a member of the Spiritual Care Advisory Committee for the Queensway-Carleton Hospital, Ottawa. Since 2002, he has served in various capacities, currently as president, on the board of directors of CanHave, an Ottawa-based registered charity supporting the education of AIDS orphans in Uganda. He is married to Karen, and together they have two grown daughters, Jennifer and Janet, both of whom are presently university students. Parkwood Church is a delightfully stimulating congregation including among its congregants individuals and families from more than 20 different countries of origin. The congregation has recently completed a renovation and expansion of its facilities to serve a changing neighbourhood by enabling people to discover, grow in and share the love of God found in Jesus Christ. In his spare time, James enjoys reading (especially church history and Christian biography), philately, and camping and canoeing. A very vague memory is of being baptized at age 4, along with my brother, who was age 1. Clearer memories are of being one of eighteen children rounded up by the organist and choir director and being formed into a junior choir, complete with gowns, and taught to sing on key by dogged perseverance on the part of the director, May Neil, who maintained she was not a Presbyterian! That I can sing at all is due to her labours and patience. As a young teen, I remember crawling on all fours across the rafters of the attic of St. Andrew’s Church, Kirkland Lake to replace burned-out light bulbs embedded in the ceiling above the choir loft, and dearly hoping that I would not crash through the ceiling into the sanctuary. Adventures at camp were also part of church, and I recall my first visit to Dorothy Lake where four of us (of which I was the eldest at age eight) applied ourselves to rescue a toad which had suffered the unfortunate mishap of falling into one of twelve three-foot-deep holes dug in the sandy ground in preparation for the raising of telephone poles to form a teepee for the main camp lodge. I was more concerned about losing one of my younger companions in the bottom of the hole than with rescuing the toad! A more serious and substantial memory is of attending a New Year’s Eve Watchnight Service at a P.Y.P.S. youth Winter Weekend at Mackay Church, Timmins, Ontario, where the host minister, Grant Muir, was presiding. Either he or the speaker (whose name I do not recall) challenged us to write out on slips of paper all the sins we could remember having committed — in the year past, and previously — and to give them as our New Year’s Eve offering, collected by the ushers in green garbage bags, which we were assured would be burned, and we could then enter the New Year forgiven by Christ, and freed of our sins. I believe we all do well when we prayerfully read a chapter of the Bible each and every day, preferably in the morning. Beyond that, regular readings from the Shorter Catechism of the Westminster Assembly, and the biographies of Christian leaders both ancient and modern are a great stimulus to wholesome thinking and faithful living. For pleasure, I read political cartoons. A recent one, a few weeks before Christmas, in World magazine showed a boy opening the front door of his house to find huge piles of boxes heaped high, and exclaiming, “Mom! There’s an Amazon Jungle on our front porch!” Much wisdom can be expressed in humour, and out of the mouths of babes comes not only praise but often profound truth. The church at its best is seen cooperatively sharing the love of Jesus, each one using a special gift given by the Spirit for the benefit of others. Several images come to mind. An elder, widowed and retired, opens his home to refugees, and helps a student learn a new language, and another to find work to support a family. Others volunteer to support a mid-week children’s programme, cooking meals or providing wholesome conversation over them to welcome the children and show interest in their lives; still others faithfully teach the Bible stories about Jesus and help children learn to sing and play instruments. A child introduced to Jesus says, “I want to be baptized”, and the congregation celebrates with joy the baptism of both child and parent. Another elder finds a way to welcome a newcomer to worship, and to converse on a smartphone using Google Translate. A bilingual college student acts as a translator for a newcomer to the young adults’ lunch and study, enabling the newcomer to share faith and conversation and be understood. All of these are images of the love of Jesus in action, and the sovereign reign of God in lives is affirmed, in a broken world that so deeply needs mending. The core calling of the Church is two-fold: to obey two great commandments: to love the Lord our God with all our heart, soul, mind, and strength, and to love our neighbour as ourselves; and to fulfill the great commission: to make disciples of all nations, baptizing them in the name of the Father, the Son, and Holy Spirit, and teaching them to obey everything Jesus has commanded. To do so is to glorify God and to enjoy Him forever! Christians are called, individually, to walk and serve in all aspects of private and public life. John Calvin articulated a doctrine of vocation. “The Lord’s calling is in everything the beginning and foundation of well-doing.” (Institutes, Book 3, chapter 10, section 6) We affirm that every Christian has a calling to serve others, and our varying gifts suit us collectively for service in every different space and place in society. Historically, Presbyterians have been strong in the support of education. John Knox and his associates in Scotland expected every parish, after supporting the local minister, to have a schoolmaster. Since “public” education in much of Canada has now morphed into something quite different from what it was originally conceived to be, there is a need for the Church to be more active and engaged in producing materials to support parents in the education of their children, and to assist congregations to aid parents in ensuring that children and young adults receive a wholistic education rooted in the perspective of a biblical and Christian worldview. As new generations find life focused in the virtual world of cyberspace, there is a need for a much more robust and engaging presence on the part of the Christian Church, including The Presbyterian Church in Canada, in analyzing, critiquing, and supporting those whose worldview and social world is influenced and shaped—for both good and ill—in the world behind the screen. Spiritual renewal is an ongoing process. The biblical motif is “day by day.” The rhythm built into the creation involving one day in seven for rest and renewal (the Sabbath) was re-affirmed in all the years of ancient Israel’s wanderings in the desert, fed by manna and quail, one day at a time. My body needs daily renewal with food and water, so I take time to eat and drink—every day, and usually more than once! My soul needs daily renewal with words from God, and so I read a chapter of the Bible each day, and sometimes more than one! My spiritual relationship with Jesus needs time and attention to cultivate, and so conversation through prayer is part of what I do daily to renew that relationship. For the church, renewal does not necessarily mean restoration, or a return to the so-called glory of former days. In exile, after the fall of Jerusalem, King Jehoiachin, though released from prison, was sustained by an allocation of food, one day at a time. “Day by day the king of Babylon gave Jehoiachin a regular allowance as long as he lived, till the day of his death.” (Jeremiah 52: 34). The apostle Paul sought to reclaim lost souls among the idol worshippers in Athens, one day after another. “So he reasoned in the synagogue with the Jews and the God-fearing Greeks, as well as in the market-place day by day with those who happened to be there.” (Acts 17: 17) He later affirmed: “Therefore we do not lose heart. Though outwardly we are wasting away, yet inwardly we are being renewed day by day.” (2 Corinthians 4: 16) Let the scriptures feed us daily, and the Church will be renewed, one believer after another, one day after another, one year to the next. The role of the moderator in any church court is to moderate. The moderator is first among spiritual equals. The moderator is to endeavour to keep order, respecting the constitution of the church. A church court is a gathering of part of the body of Christ, for prayer and counsel together, and corporate service and action. The moderator is called to act in the spirit of Christ who stooped to serve and by example is to call others to do likewise. While seeking to discern the mind of Christ on any and all topics, including matters of human sexuality, the moderator is called to lead in prayer, to enable all who speak in the power of the Holy Spirit to be heard, and to encourage all who listen to do so attentively and respectfully. The moderator is called to give voice to decisions made. The moderator is to remember and remind that all councils of the Church are subject to error, and have erred. Blame for things done amiss is to be acknowledged and confessed; credit for those done aright is to be humbly laid down at Christ’s feet. We are called to be stewards of the creation. That we are living beyond our means is sinful—economically, as we impose debt on future generations, and environmentally, as we deplete resources and damage and even destroy the capacity for regeneration. May God help us to be those who use what is necessary and not all that is available, to reap what we have not sown, and to sow generously for others to use in the future. The church is called to foster engagement on many levels throughout the world. Building relationships that cross partisan political interests is urgently necessary. As Christians we are called to show the way to care for neighbour, at all levels. One of the songs sung by the ancient Hebrews while they travelled up to Jerusalem for thrice-yearly festivals begins: “How very good and pleasant it is when kindred live together in unity!” (Psalm 133:1, NRSV) Unity is a blessing and is to be celebrated. When Paul addressed the Corinthians, he faced a church marked by dis-unity. There were several groups, each with a revered leader. He seeks to point all to focus their attention on Jesus Christ, and not on human leaders. He affirms the diversity of gifts, and allows for and encourages different people to use different gifts to strengthen the whole body of Christ. Love is the greatest enduring gift. Yet he also affirms that there are limits. The one who is sexually engaged with his own father’s wife is not welcomed—not because Paul is judging him, but because Paul is loving him, and desires “that the sinful nature may be destroyed and his spirit saved on the day of the Lord” (1 Corinthians 5: 5). Unity in Christ is God’s goal. Diversity in the church of Christ is God’s design. Yet it is God who designs and Christ who unifies. Our challenge is to humbly follow, led by the Holy Spirit. My experience ecumenically has been broad and rich. I have worshipped and prayed with Christian brothers and sisters from a great many countries around the world. I have known and cherished Presbyterians from every continent and many islands in between. I have also shared in worship or other public gatherings with Christian pastors ordained or appointed across the whole ecclesiastical spectrum: Orthodox, Roman Catholic, Anglican, Lutheran, Christian Reformed, United Church, Wesleyan, Evangelical Free, Baptist, Pentecostal, Mennonite, Salvation Army. Those who have joined us for ESL (English Second Language) conversation over the past ten years have come from many of the twenty different countries of origin represented among the membership at Parkwood Church, Ottawa, and also several others. We have sought to meet those who live and work in our neighbourhood, and encourage, respect, and dialogue with individuals who are Muslims, Hindus, Buddhists, and others with no religious profession. My prayer for all who are, have been, or will be part of The Presbyterian Church in Canada and/or of the wider Christian Church finds voice in Romans 15: 5-6—“May the God who gives endurance and encouragement give you a spirit of unity among yourselves as you follow Christ Jesus, so that with one heart and mouth you may glorify the God and Father of our Lord Jesus Christ. Our sure and certain hope is rooted in the resurrection of Jesus Christ from the dead, as the firstfruits of all who believe. Our confidence is built upon Jesus’ response to Peter’s confession of faith: “Upon this rock I will build my Church, and the gates of hell shall not prevail against it.” (Matthew 16: 18, KJV) All over the world, people today continue to hear and see and believe the gospel. Many of our congregations are enriched by those who have joined us from afar, bringing with them a living faith; others have been born anew in our midst and share their joy in the Lord Jesus with us, spurring us on to love and good deeds. The indulgence and emptiness of much of our materialistic culture leads many to dependency, addiction and despair, but that creates a great opportunity for Christians to point to the One who has not turned against us — yet — but who offers to those who come to their senses the forgiveness of a loving and merciful Father who has yet good gifts to share and shower upon beloved and adopted children. J. Oswald Sanders, who served as director of OMF International (the successor to the China Inland Mission), wrote a book entitled Spiritual Leadership, drawing from the lives of Christian leaders through the centuries; the book was instrumental in my call to ministry—I read it three times and finally said, “Yes.” Samuel Rutherford, one of the Scottish commissioners to the Westminster Assembly called by the English Parliament and who later died before he had to answer trumped-up charges of high treason, remains a great comfort not only for his Letters, full of spiritual counsel, but also for the fragments of speech uttered before his death and which Anna Ross Cousin wove into the hymn, “The sands of time are sinking” which serves to view the challenges and sufferings of life in the light of the glories of eternity in communion with the living God. Thomas Watson, arguably the most readable of the English Puritans, has tremendous illustrative power in his commentaries on the Ten Commandments and the Lord’s Prayer, and remind me to try to make sermons simple and appealing to people from every walk of life. The commentaries of John Calvin, though now approaching five hundred years in age, remain very valuable for their clear insight into the main point and thrust of so many passages of Scripture. George Leslie Mackay was a Canadian Presbyterian who is revered today by the people of Taiwan because he met the native peoples how and where he found them, provided immediate relief to those in pain by extracting decaying teeth, learned from them their language, and then introduced them in their language to Jesus Christ; as pioneer missionary in that land he is honoured as the father of the Christian church there but also of both modern medicine and education, and in Canada is remembered for having served as moderator of the General Assembly and for championing the cause of justice against the discriminatory head tax imposed on Chinese immigrants by the Canadian government of the day. He wholeheartedly embraced another culture and language, but more profoundly, a people—marrying cross-culturally a Chinese woman, Minnie, and raised a family. While a student preparing for ministry in Toronto, I was privileged to know personally his great granddaughters, worshipping and serving alongside Anna, Margaret, and Isabel Mackay.